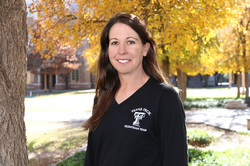 Danica Jorgensen began coaching the Texas Tech Equestrian Team in 2009, while studying for her masters degree in Animal Science at Texas Tech University. Originally from El Paso, Texas, Danica began riding and competing at the age of 5. As a youth rider, Danica was Top 10 at AQHA Youth World multiple times, and before turning pro, also was an AQHA World Show Finalist in Working Hunter & Hunter Hack. For two years, Danica was the assistant trainer to Bill & Tina Kaven, where she fine tuned her training and instruction skills while showing Western Pleasure horses in all the AQHA majors. She then worked for a year as assistant trainer to Nancy Sue Ryan, training and showing Hunter Under Saddle horses. She now owns and operates Danica Jorgensen Show Horses out of Lubbock, Texas, training many AQHA Amateur & Youth Riders specializing in Western Pleasure, Trail, Western Riding. Horsemanship, Showmanship, and Hunter Under Saddle. She is an NSBA World and Reserve World Champion trainer in Working Hunter, Equitation over Fences and Hunter Hack. During her time as Texas Tech Equestrian Team Coach, she has lead two riders to Top 10 Finishes at IHSA Nationals in Reining. Under her guidance the team has grown from 10 western riders to 20+ riders, and consistently places as High Point or Reserve High Point Team.